MARVEL AVENGERS ACADEMY: Arctic Armor Pepper Event is Live! Well you've been asking for Pepper to come back and it looks like TinyCo have delivered with this new Arctic Armor Pepper Event! You can also buy Red Hulk and A-Bomb for shards, and finally... a new login bonus in the form of Mockingbird! In order to participate, players must download the latest update and be at Academy Level 7 or higher. Begin the quest "She Means Business!" to start the event! The Arctic Armor Pepper Event ends on December 8 at 3 pm PST/6 pm EST. How do I recruit Pepper Potts? Once you turn in these items, Pepper Potts will join the Academy. She must be completely unlocked by the end of the event or she will disappear from the game at that time. How do I unlock Arctic Armor Pepper? How do I unlock Red Hulk? 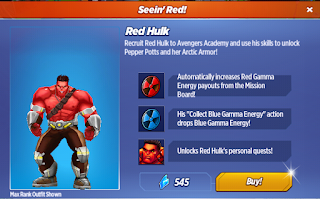 Red Hulk is available to recruit for 545 Shards! You can find him in the Shop. He increases Red Gamma Energy drops from the Mission Board! He can also perform the action "Collect Blue Gamma Energy." How do I unlock A-Bomb? A-Bomb is available to recruit for 545 Shards! You can find him in the Shop. He increases Blue Gamma Energy drops from the Mission Board! How do I obtain event decorations? Collect Red Gamma Energy and Blue Gamma Energy to obtain the Gamma Cannon, the Hulk Buster Prototype, and other cool prizes! Once you obtain enough Gamma Energy, these items will be available for you to claim for free. Claiming them will not take away from the amount of Gamma Energy you currently have. How do I unlock Mockingbird? 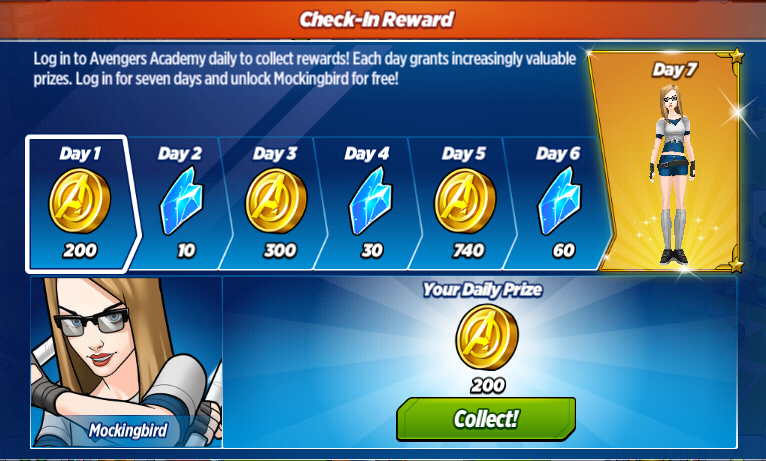 Log in to the game for 7 days to get Mockingbird! Each day you log in grants you an awesome reward. Claim Mockingbird at the end of 7 days of logins! You do not have to log in 7 days in a row to receive this character. Skipping a day between logins will still allow you to unlock Mockingbird. Arctic Armor Pepper Potts: This Arctic Armor is amazing, Tony! Iron Man: I gave it a flamethrower and cryogenic beams, toughened up all of the weapons and systems, and upgraded the HVAC system to keep you warm in sub-zero temperatures. Arctic Armor Pepper Potts: It's so nice of you to build this for me to deal with all of the recent unexplained storms and freezing conditions around the world. Iron Man: Yeah, and this Arctic Armor Model 1.4 is a prototype, so if it blows up or something, I'll know what changes to make for 1.5. Arctic Armor Pepper Potts: What are you talking about? Loki: Icy blue alternate outfits are my thing. You can't just appropriate my Frost Giant origins all willy-nilly. Arctic Armor Pepper Potts: It doesn't have anything to do with you or Frost Giants. It's made to help me deal with all of the unexplained blizzards around the globe. Loki: Too bad it doesn't help with your bad attitude. Arctic Armor Pepper Potts: The only thing that would help with that is not having to deal with you. Nick Fury: Have you been able to get in touch with our next set of recruits? Arctic Armor Pepper Potts: No. Nico, Sif, and Squirrel Girl have been trying to help, but we lose contact in the areas with the unexplained blizzards. Iron Man: How are you liking the suit? Arctic Armor Pepper Potts: I love it, but how do you turn down the music? Iron Man: You can't turn down Tony's Arctic Cool Jams. That's against the laws of awesome playlists. Arctic Armor Pepper Potts: It just makes it hard to concentrate. I'm trying to focus on figuring out these storms, and bringing in our next set of recruits. Arctic Armor Pepper Potts: What do you mean you're already making weapons and armor for the new recruits? You haven't even seen them yet. Iron Man: I have this little thing I like to call the internet. When girls made of stars, and big, beautiful, green women walk around, people tend to take pictures. Arctic Armor Pepper Potts: We aren't even sure what we're up against. How do you know what kind of weapons to make? Iron Man: I meant to do that. Arctic Armor Pepper Potts: Just leave this to me, Tony. I'll travel to each freezing area, find the new recruits, and make sure they get here safely. Iron Man: Always remember that even if the Arctic Armor's HVAC system fails, our smoldering passion will keep you warm. Arctic Armor Pepper Potts: You almost made me puke inside my helmet. Arctic Armor Pepper Potts: You might consider joining Captain America's inspirational speech club. Odin: You're as resilient and relentless as anyone here, Pepper Potts. Ready yourselves for war. The greatest victories come from conquering insurmountable odds. Iron Man: Are you hurt?! Iron Man: Did you find the new recruits? Arctic Armor Pepper Potts: Yeah, but they all wanted to stay together to fight the Frost Giants and Dark Elves. Iron Man: Did they ask about me? Arctic Armor Pepper Potts: Yes, Tony. They were fighting an army of giants in the middle of a magical blizzard, but all they talked about was you. Iron Man: I still got it. Please keep an eye out for a separate post on Mockingbird! What do you think of the Arctic Armor Pepper Event? Are you excited to unlock Pepper if you didn't have her? What about Mockingbird? 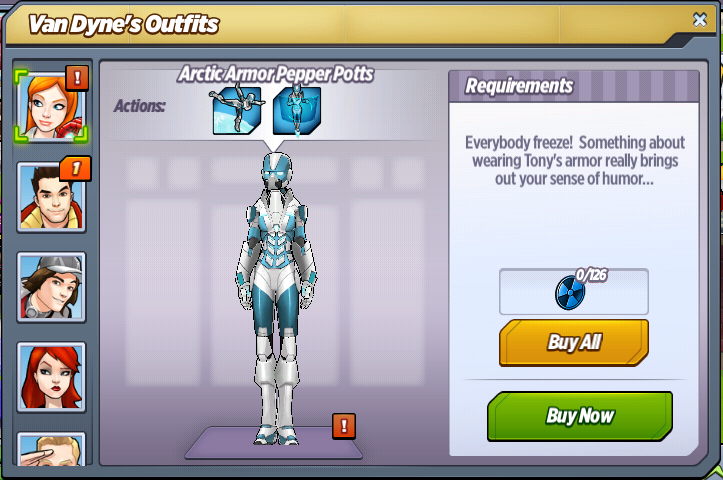 It seems counterintuitive that Arctic Armor Pepper hasn't been used (yet) in the A-Force event.